On an exceptional trip to New York City over the past weekend, I traveled there to attend the memorial of a former music industry colleague, the legendary Jerry Wexler. His name is symbolic with many music industry icons covering the musical alphabet starting from A to Z. I was delighted to attend the occasion and profoundly honored by the invitation. The event was co-sponsored by Atlantic Records and Rolling Stone Magazine while being coordinated by Wexler's son & daughter, Paul and Lisa Wexler. As I ventured across country from Seattle to attend, there was much going on in the city to keep one occupied during this last weekend in October of 09. Plus not to mention, the weather there at the time was exceptional. My single purpose was to attend the Wexler Memorial but there were also other major activities in the city taking place simultaneously. First, there was the World Series game between the New York Yankees and the Philadelphia Phillies. Then there was the Rock & Roll Hall of Fame Concert at Madison Square Gardens. Next there was The New York Marathon, a huge event I might add. And of course please don't forget, it was also Halloween weekend. These factors are what produce the vibrant pulse of the city and yield it's energetic charm. In this current cycle of a poor economy, the business climate of entertainment, commerce and fashion were all in full swing. With expectations being high for The Jerry Wexler Memorial, attendants came to the event from many different locations. Here are some highlights of this landmark occasion courtesy of THE PHOTOLOG. The Jerry Wexler Memorial was held at the prestigious Director Guild Theater in the heart of Manhattan. Despite the familiar drawbacks of attending a traditional memorial, there was an uplifting spirit and positive vibe in the air. As you entered into the lobby of the building there was a beautiful oil painting of Jerry Wexler displayed for viewing. As I stared at the picture and drifted away for a moment, I was filled with memories of this remarkable man. Jerry's son Paul Wexler was the emcee of the grand occasion. His sister Lisa's band named, "Big Sister" performed several songs also. Both Lisa and Paul performed admirably. A video of Wexler's achievements was shown to the audience displaying archive photographs dating back to his childhood with his parents and family and young adult years. There were also photos from his years while serving in the Armed Forces combined with significant early career pictures at Atlantic with Ray Charles and Aretha Franklin. Pictured above is a shot from the 60's of the signing of Wilson Pickett (seated) at the Atlantic offices. 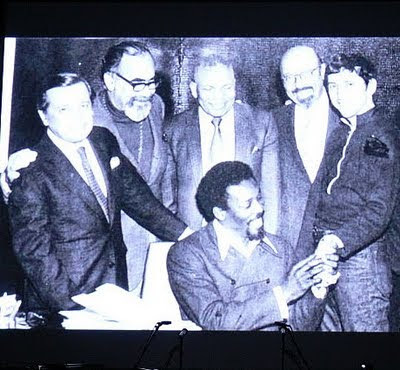 Standing (L-R) is Nesuhi Ertegun, Jerry Wexler, Henry Allen, Ahmet Ertegun and Jerry Greenberg. Unable to attend the memorial, Jerry Greenberg is seen here delivering a personal video message commemorating Wexler's brilliant career. Wexler hired Greenberg in 1967 while the two worked closely for many years. Mark Meyerson was an A&R executive at Atlantic while serving as Jerry Wexler's assistant in the late 60's through the middle 70's. Meyerson delivered a marvelous speech and credited Wexler for his career start. As the individual speakers completed their stories including a powerful delivery by Wexler's official biographer David Ritz, there were also written notes from Steve Cropper and Zelma Redding reflecting their memories of Wexler. Next, the lights went down and the performers took the stage. Standing on far left is Bonnie Raitt while Allen Toussaint is seated at the piano. Song crafter Joe South delivers his hit song, "Walk A Mile In My Shoes" while drummer Anton Fig and band leader Jon Tiven provide support (bassist Jerry Jermont in background). On the right here is William Bell as his powerful voice sends chills through the audience while famed Memphis keyboardist Spooner Oldham (left) and Muscle Sholes guitar legend Jimmy Johnson (center) provide the rhythm. There was also an outstanding vocal performance by Lou Ann Barton plus a show stopping song and story by Betty Lavette that highlighted the memorial. After the memorial concert two former STAX Records colleagues William Bell and Phillip Rauls reunite and share stories. Legendary drummer Benard Purdee, former Atlantic Artist Relations Coordinator Barbara Harris and noted bassist Jerry Jermott are all smiles. Memorial speaker and now 20th Century Fox's Senior VP of Legal Affairs, Mark Meyerson (L) along with former Atlantic A&R executive, Jim Delehant (C) and former Atlantic promotion executive Phillip Rauls catch-up on old times at the Directors Guild Theater. Long time associates Jon Tiven and Phillip Rauls chat backstage and reminisce about the good old days dating back to The Rock Writers Convention. Tiven organized the band for the Jerry Wexler Memorial event and is also an accomplished producer with multiple credits. The memorial ended with old friends exchanging hugs and kisses and wondering what might be the next occasion that brings all parties together. Those thoughts might be foreign to some but such is the case with many who were attending this occasion. I know personally that my time spent with Jerry Wexler is a highlight of my career - and also grand moments in my life. Case being, for years I'd brag about the dolphin that was displayed above my fireplace and the fact that it was caught while fishing aboard Jerry's boat named, "The Big A" as in, 'The Big Atlantic.' That small claim to fame was the beginning to many a late night story about Wex. There were many of those stories being exchanged at this memorial. And rightly so. Let's hope that at some point in time there will be a Jerry Wexler video documentary for all of us to embrace. Love you Jerry. More bass please. A previous posting of the legend of Jerry Wexler can be viewed at The Photolog's archive by clicking Jerry Wexler. Copyright (c) Phillip Rauls - Rauls Media LLC - All Rights Reserved.